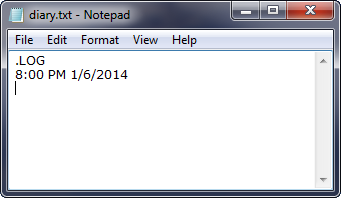 Quick Tech Trick # 3: How to use Notepad as a diary or a log or a Journal? - Blogger I.Q. You are here: Home / Guide / Quick Tech Trick # 3: How to use Notepad as a diary or a log or a Journal? Quick Tech Trick # 3: How to use Notepad as a diary or a log or a Journal? Bam! You now have mastered the art of creating a Simple Diary! Enjoy.